Home | Bath & Body | Dove Company History And Review: Real Beauty, Real Soap! You really can’t talk about the state of soap, cleansers, or personal care products without mentioning Dove. A company that sells more soap than any other, Dove has become synonymous with the soap bar in the same way that Kleenex is synonymous with tissues – you just can’t separate one from the other. 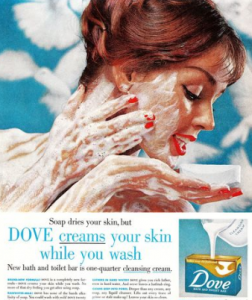 Despite their late start in soap development relative to other leading beauty brands (the company was founded in 1957), Dove proved to be ahead of its time in the cleaning department. Washing and Bathing: Beauty Bar, Liquid Soaps, Body Wash. Skin Care: Moisturizing, Dry Skin Care, Body Lotion, Face Wash.
Antiperspirant Deoderants: Antiperspirant Deodorant Spray. Roll-On Antiperspirant Deodorant. Hair Care: Shampoo, Conditioner, Hair Oil, Dry Hair Treatment, Hair Fall Treatment Anti-Dandruff Treatment, Damaged Hair Care, Shampoo for Dry/Damaged Hair. Dove Collections: Dove Go Fresh, Purely Pampering, Dove Elixir Oil, Dove Oxygen Moisture. One thing you may note in examining Dove’s line of products is that absent are any sort of makeup or cosmetics supplements. This is because Dove believes in helping consumers embrace the bodies that they have, and does not encourage the use of cover-ups, makeups, or concealers. This mindset led to the 2004 launch of the Dove Campaign for Real Beauty. A worldwide marketing campaign designed to celebrate the bodies of women of all sizes and types, Dove’s Real Beauty campaign has been carried on to this day in the form of advertisements, videos, workshops, sleepover events, and more. The campaign represents another instance in which Dove has proven to be ahead of its time (in addition to their revolutionary soap). While many companies embrace the social issues of the modern day for the sake of public relations, Dove not only embraced the ‘beauty at any size’ and ‘body positivity’ mantras before they hit the mainstream, but helped to grow them. This successful and universally celebrated campaign has helped the Dove brand grow to unprecedented heights – the company continues to achieve new milestones all the time. Before we look at the future of Dove, however, we’re going to examine the past, here in our Dove Company History and Review feature. There’s no telling how high this Dove can soar! Click Here for the Lowest Prices on Dove Products! From the very beginning, Dove attempted to stand out in the personal care scene rather than blend in. Lever Brothers’ Dove Beauty Bar hit the market in 1957, representing the first Dove-branded foray into the soap market. Dove’s soap advertisements reflected these moves to stand out, boasting that Dove soap was ‘much better for your skin’ than regular soap due to its mildness and its content of ‘one-quarter cleansing cream.’ Dove advertisements even included taglines such as ‘Suddenly soap is old-fashioned!’ and ‘Dove creams your skin while you wash’. 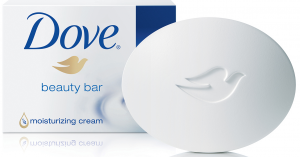 Additionally, Dove’s bars of soap took on a unique, curved shape while Dove packaging featured simple and elegant coloring surrounding the now iconic Dove bird logo. This made for easy brand recognition and distinction within the minds of consumers – Dove quickly succeeded in establishing itself is an innovator and outsider in the world of soap. In terms television advertisements, which were a fairly new marketing outlet in the 1950’s, Dove displayed cream being poured into the Dover bar in order to illustrate the moisturizing quality of the soap. The Dove Face Test Campaign was another early marketing campaign of Dove’s, in which advertisements displayed a woman who washed half of her face with generic soap and half of her face with Dove soap. The half washed with Dove soap would, of course, display a clear, clean, and moisturized complexion while the non-Dove side was dry and featured soap residue. Modern Dove face test advertisement. The 1960’s saw the expansion of Dove to several different international markets, as well as an evolution of sorts of Dove’s advertising campaigns. Dove responded to the climate of the times by developing ads that empowered women. The 60’s saw a new wave of feminism hit the United States, with women displaying a newfound willingness to enter the workforce. Dove used its first “Real Women” tagline in a number of ads which featured mock hidden-camera testimonials of professional women heaping praise onto Dove products. As the 20th century progressed, so too did Dove’s catalogue as the company incorporated more complex and specialized products designed to sufficiently cover every end of personal care. 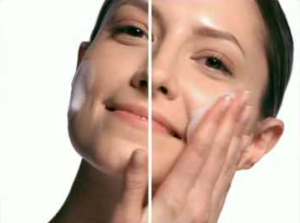 In terms of skin, Dove would introduce moisturizers and dry skin care, among other products. 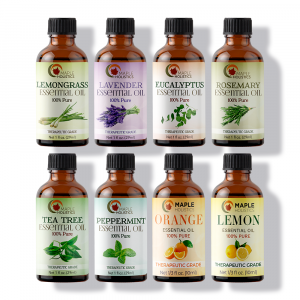 In the 1980’s, the company developed specialized hair care treatment for dry or damaged hair, as well as hair oils. This Dove become a global leader in bath time hair care to supplement their skin and soap dominance. The 1990’s saw Dove undergo a global product roll-out to over 80 countries, as well as an expansion of Dove’s product catalogue. For starters, Dove began to branch out by producing different kinds of shampoos, deodorants, and cleansers. The company made it a conscious goal to cover the full range of skin and hair cleaning, and did so effectively by introducing products that exhibited the same moisturizing qualities as their patented Dove soap bars. The acclaimed and groundbreaking ‘Real Beauty’ campaign by Dove initially came about as a result of internal research by Dove and associates which indicated that just 2% of women consider themselves to be beautiful. This shocking statistical revelation has been buffered by a Dove advertisement which drove home the same message. In a viral Dove video advert, a sketch artist drew two pictures of the same women based on their self descriptions, as well as description by a third party. In each case, the sketch based off of the third party description was more flattering than that of the one based off of the self description. Responding to their findings, Dove decided to launch a campaign that promoted self-confidence, as well as the promotion of realistic beauty standards. The goal of the campaign in the words of Fernando Machado, global brand vice president for Dove Skin is “to create a world where beauty is a source of confidence and not anxiety.” The first stage of the campaign saw global billboard advertisements featuring regular women, not models, whom folks were encouraged to vote on whether or not they were “fat or fab,” for example. The votes were updated in real time on the billboard, which were generally overwhelmingly positive – encouraging real women in the real world. A series of mini-documentaries designed to promote realistic beauty standards would follow, the first of which was titled “Daughters.” The film featured mothers and daughters being interviewed regarding perceptions of beauty and the beauty industry, and was a rousing success, resonating around the beauty world as well as in the mainstream. However, the campaign has been polarizing to say the least. A number of media outlets pointed out the perceived hypocrisy on the part of Unilever, which has found great success in marketing skin-lightening supplements under different brands. It must be noted, however, that Dove is essentially its own entity, unable to control the actions of different companies and brands. Ultimately, Dove has received a mixture of praise and criticism that has been consistent with the political leanings of the entities which have given it. As the Huffington Post accurately pointed out, we will have to wait until a generation of young women raised through this prominent message grows up to see its ultimate results. 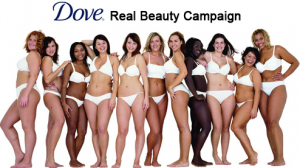 One thing’s for sure, however: Dove’s Real Beauty Campaign has left a serious imprint on the world, and has done an excellent job of raising awareness for this important issue as well as for the Dove brand. Dove has experienced tremendous growth throughout the course of this campaign, and doesn’t appear likely to slow down anytime soon. Now that we’ve covered the history and optics surrounding Dove, it’s time to dive head first into Dove’s incredible line of products! We will begin, fittingly, with Dove’s Body Wash and Beauty Bars. The flagship offering of Dove, the beauty bar still uses 1/4 moisturizing cream (as it did in its original formula) to provide softer, smoother, healthier-looking skin that feels as great to boot. The taglines haven’t changed either, as Dove still boasts that the beauty bar doesn’t leave skin dry as competing bars of soap do. The Dove Beauty Bar is the most popular consumer bar of soap in the world, and for good reason – the results and reputation speak for themselves. Dove’s Beauty Bar for Sensitive Skin and Pink Beauty Bar compliment the original Beauty Bar nicely – with Dove, there’s truly something for everyone looking for a bar of soap. Meanwhile, for those who do not favor the traditional bar of soap, Dove offers a variety of liquid body washes. Dove Deep Moisture Deep Wash is one of the most popular Dove Body Washes, as it uses NutriumMoisture technology to deliver nourishment to the skin, moisturizing just as well as Dove’s Beauty Bars. Dove Sensitive Skin Body Wash and Men + Care Body Wash help round out Dove’s body wash line, which is threatening to overtake the beauty bars in popularity – no small feat! Recognizing that skin care begins but doesn’t end with a bar of soap, Dove has developed an entire line of outside-the-bath skincare products designed to promote healthy, clear skin. For starters, Dove Cream Oil Body Lotion uses real shea butter to reveal silky, smooth, and healthy skin. The oil lathers and penetrates the skin in order to create a moisturizing effect that works and lasts. Dove Cream Oil Intensive Body Lotion, on the other hand, uses a blend of nourishing oil and hydrating cream in order to sooth dry skin and promote moisture and skin health. Either lotion is a great choice if you’re looking to improve or maintain your healthy skin! Looking For The Lowest Prices On Soap? Click Here! 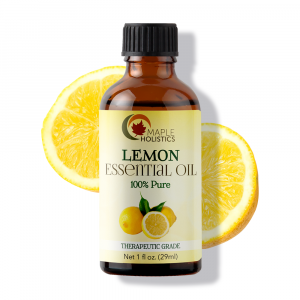 One of the best ways to keep yourself clean and smelling fresh? Stop the sweating before it starts! Dove’s deodorant line is designed to accompany Dove cleansing products in order to keep you protected and ready at all times. Dove Clinical Protection is the company’s strongest deodorant offered and uses prescription-strength wetness protection in order to soothe and condition skin. The formula uses dermatologist-endorsed ingredients and owns a proven track record of success. Dove Dry Spray Antiperspirant is available in different types, such as soothing chamomile, and provide up to 48-hours of protection in a convenient spray package. Many soothing fragrances are offered, so you’re sure to find something that you like. Finally Dove Go-Fresh Antiperspirant represents Dove’s standard entry into the deodorant game. Go-Fresh is made to accommodate delicate underarms and to help recover from shaving irritation – it is a true multi-purpose deodorant! Take your deodorant to the next level with Dove Advanced Care. It’s important to remember that a babies skin is a lot more sensitive than an adults. This is largely due to their skin being thinner than ours and having less of a protective acid mantle layer, due to their sebaceous and sweat glands being less effective than an adults. So as a result, babies and young children require skin care products that are specially refined for their sensitive skin types. This means that they have to be free of many of the harmful chemicals that so often have a negative effect even on adult skin. Dove is a company that has always striven to produce the best products for sensitive skin types – so it comes as no surprise that their Baby Dove line is exceptionally well-suited to young and sensitive skin types. Let’s take a look at what this line includes. Firstly, we have the Baby Dove Tip to Toe Wash. 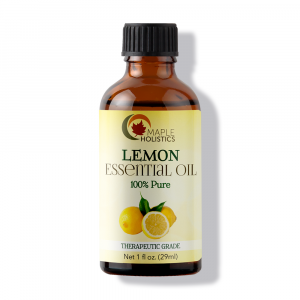 This is an exceptionally effective cleansing wash and helps to remove dirt and grime without drying out your child’s skin. This also makes it suitable for adults with skin issues such as eczema or psoriasis as it’s mild and soothing. It hydrates a lot better than the Baby Dove Soap Bar in my opinion, but if you’re tight on cash, the soap bar will work just as well. Then comes the Baby Dove Nourishing Lotion or the Baby Dove Sensitive Skin Lotion. I’m not sure how much of a difference there are between these products (the ingredients lists look quite similar) but they’re both pretty effective nonetheless. The lotion absorbs quickly and easily and will keep the skin feeling hydrated throughout the day – even after just one application. It’s become my preferred moisturizer at the moment, so I share it with my two year old! The Baby Dove Diaper Rash Cream is a great product for when your child has those uncomfortable diaper rashes and is keeping you up at night, crying over the irritation. Simply apply a healthy dollop of the stuff to the affected area and wait as it’s cooling, soothing recipe takes goes to work on the irritated skin. It also helps to build up a light barrier, thus helping to prevent the onset of rashes in the first place. A definite must have for young children who love running around a lot. Finally, we have the Baby Dove Baby Care Wipes. These are the quite the same as most sanitary wipes – except that the formula is a little less heavy in terms of it’s use of industrial chemicals. This means they’re safer than most conventional sanitary wipes. However, I would recommend trying a few different brands of child-friendly wipes as these aren’t flushable and you can find a cheaper alternative that is just as effective. So don’t stress too much about these – but they do smell really great and are quite effective as a makeup remover as well. So approach them with an open mind. Dove Hair Care Review: Shampoo, Conditioner, Dry Shampoo, Hair Masks, Hair Serum And More! If you thought Dove doesn’t mess around while reading about their great line of soaps and deodorants, just wait until you get a load of Dove hair care! Dove offers a large number of shampoos, but in particular we would like to highlight Dove Advanced Series Oxygen Moisture Shampoo. Using lightweight, oxygen-fused ingredients, Dove Oxygen Moisture cleanses the hair while adding natural-looking volume, making for a natural, healthy looking head of hair. Moving on to Dove Conditioners we have Dove Nutritive Solutions, which instantly detangles hair in order to improve manageability and cleanliness. The conditioner makes hair softer and smoother by using Dove’s Pro-Moisture Complex, which is designed to promote hair health and appearance. Dove Advanced Hair Series Intense Restoration Mask helps coarse, naturally curly hair in the form of a simple, convenient treatment. The nutrients, protein, and buriti oil within the mask moisturizes and soothes in order to create a more healthy, attractive head of hair. Next up, Dove Advanced Hair Series Supreme Crème Serum provides a hair care treatment in a convenient, on-the-go package! Be sure to check out our Dove Top Products Review here at Maple Holistics – or learn about Lush, Urban Decay or Nivea! Moisturizing naturally curly hair in order to quench hair dryness, the serum provides easy treatment anywhere and leaves hair looking soft, strong, and healthy. A number of other products, such as Dove hair styling, solutions for dull, dry, damaged, frizzy, and curly hair, as well as volumizing hair care products, round out Dove’s excellent hair care line – try any of them today to put Dove to work for you! Dove care for damaged hair.